Weed Chamber announces winners of Light up Weed Christmas Lights Contest! Each holiday season, the Weed Chamber sponsors a holiday yard lighting contest within Weed with 3 winners who will each receive a check for $25 from the Weed Chamber of Commerce. 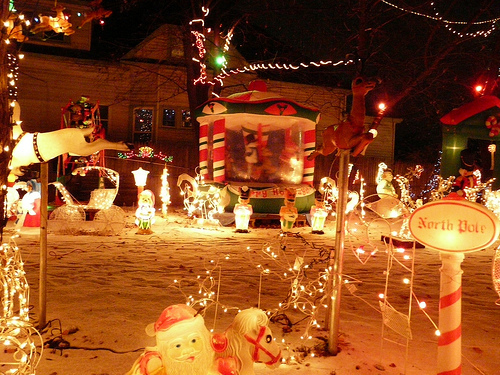 All homes were judged on their outdoor decorations only and judging Categories were Best Traditional Home, A Child’s Christmas, and Most Spectacular Yard Display. This yearsjudging took place on Friday Dec. 18th. As one of the judges I can say it was very difficult to narrow down to just three winners. Weed really came out and decorated their yards from lights and garlands to Merry-go-rounds, giant snow globes, reindeer, it was amazing! There were many neighborhoods that offered up spectacular displays including the Lincoln Heights area and School Hill neighborhoods to name just a few. The Weed Chamber of Commerce would like to thank all the homes and families who participated in the Light up Weed Christmas Lights Contest!